When you have surgery to address joint pain, one of the normal expectations is that you will be better following the procedure. After all, that’s the very reason you are having an invasive procedure in the first place! There are times, though, when a patient doesn’t feel better afterwards. If the problem has been ongoing for longer than six months—and the symptoms include painful sensations that might be described as burning, shooting, stabbing, or tingling (amongst others)—it’s possible the issue comes down to nerve damage. In this case, come see us for a consultation and we can evaluate the problem and determine if we may be able to help. Orthopedic surgeons who perform joint surgery do their absolute best to correct whatever bone, muscle, or connective tissue problem is causing pain or restricting your movement. These doctors are highly-specialized in anatomical structure and how the body moves. Sometimes, though, when they are correcting the problem a patient has seen them for, issues develop afterward. Having said that, it’s important to make a distinction between post-surgical nerve pain and orthopedic issues. Orthopedics is the medical specialty concerned with skeletal issues. When the problem comes down to how your body moves, you may need the help of an orthopedic specialist. 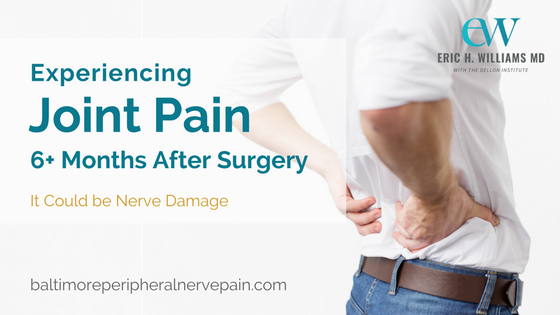 If you had joint surgery six months or longer ago and are having sharp, shooting, or burning pain, hypersensitivity, the feeling of pins and needles, or electrical sensations, then the problem is more likely nerve-related. In this case, you would want to see a nerve surgeon instead of an orthopedic one. Generally speaking, potential causes of nerve damage during or after a surgery include severed nerves, nerves entrapped in scar tissue, and adjusted body tissue pressing against a nerve. Hip replacement is a specific procedure that can result in joint pain following the surgery. The reason for this is related to the position of the sciatic nerve in relationship to the hip joint. When the hip is dislocated or the sciatic nerve—specifically, the peroneal division—is stretched or impeded by migrating cement, there may be direct nerve damage. Another potential nerve that can be impacted by knee replacement surgery is the femoral nerve. With regard to an upper extremity nerve pain following a surgery, the radial nerve can become damaged when either the elbow or shoulder joint is replaced. Signs of this nerve damage include hand or wrist weakness and numbness in the limb. There are certainly other joint surgeries that may result in nerve issues. If you have had joint surgery—of any variety—and are experiencing problems related to peripheral nerve damage long after the procedure (6+ months), we might be able to help. Contact our office by calling (410) 709-3868 for more information or to request an appointment. We will be glad to evaluate your condition and determine if one of our procedures can possibly relieve the pain you’ve been living with for too long now.